We’d love your help. Let us know what’s wrong with this preview of The Bearer's Burden by Chad Queen. The trail has gone cold, but he is given one last chanc Cade Elegy’s mind is tearing itself apart, crowded with the phantoms of the dead, and he must carry the burdens they could not. To ask other readers questions about The Bearer's Burden, please sign up. Wow! No way is this a debut novel! Queen does a masterful job in first third of the book, setting the stage with world building; history, people groups, characters, systems, and more. But truly a third of the way in, watch out, because it is absolutely page-turning action. Amazing twists, epic scenes, brilliant character and relational development, and a myriad of wonderfully uniq Wow! No way is this a debut novel! But truly a third of the way in, watch out, because it is absolutely page-turning action. Amazing twists, epic scenes, brilliant character and relational development, and a myriad of wonderfully unique and original ideas to the genre. I also really appreciated the “excerpts” at the beginning of each chapter, which tease just the right amount of background information on the history or systems of the world, while subtly piquing the reader’s interest with foreshadowing. I loved Queen’s writing style, that transported me to his world with detailed, sensory descriptions! It reads and flows just like the other titans of the genre. Chad Queen demonstrates brilliant imagination with his complex world-build. Chalice is a place where those appropriately trained can conscript the phantoms of the recently passed by entering into a pact with them. The price is high--having more than one consciousness simultaneously can drive the bearer insane. However, Cade Elegy, the protagonist, fights through this and many other battles in this primary installment of this new series. In addition to the masterful world build, Queen tells a grea Chad Queen demonstrates brilliant imagination with his complex world-build. Chalice is a place where those appropriately trained can conscript the phantoms of the recently passed by entering into a pact with them. The price is high--having more than one consciousness simultaneously can drive the bearer insane. However, Cade Elegy, the protagonist, fights through this and many other battles in this primary installment of this new series. In addition to the masterful world build, Queen tells a great story. The plot has twists and turns, and the ending satisfies. Enough is left for future work, but you don't get the feeling of being robbed of a conclusion. The characters are rich and well developed, including Cade, his archaeologist friend, the Royal family (the King and three heirs), and a sophisticated intelligence that helps him survive his battles. The Ancient race is referenced, and the "Traveler" is someone I expect we will hear more about in subsequent novels. Queen intersperses descriptions of the religion of Coda, the drug to suppress insanity used by Bearers, the planes of existence, and the Wraith species plus their slaves, the Skex (the bad guys), to explain the standard good versus evil battle. It's complex and well thought-out. However, the sophisticated world-build creates two problems. First, I spent about ten chapters with no idea what was going on, and I almost put the book down. Second, the length made it challenging to retain the plot in my head between reading sessions. That's only a problem if you can't read it cover to cover in a short period of time, but for busy readers, it's a bit much. My main criticism would be the way the main character "suddenly" solves all of his problems. The most glaring example is his addiction. As he bonds more phantoms, instead of going insane or needing more Nocturne, Cade simply continues on unburdened. Eos is a classic use of "deus ex machina" and the number of times characters appear to die but do not strains credulity. The technique of using a chapter introduction to "tell" rather than "show" different details can be forgiven, as there are plenty of action scenes and some spoon-feeding works in this setting. Thank you, Chad, it’s a very good book!! Not the genre I like the most but indeed catching and keeping the attention! It was a while I wanted to know what the next page brings.. keep writing, you are good at that! This is a fantasy that has a few takes from elsewhere as far as naming goes. We have a planet that is being subjected to wraiths, and ancients have had much stronger technology, but they have ascended. You may recognise a little here. Nevertheless, this has originality. Apparently, when you die, your spirit wanders in a space (analogy – purgatory?) but a bearer can incorporate such spirits, and in return the spirit conveys magical properties. For example, if someone propels some weapon at a bear This is a fantasy that has a few takes from elsewhere as far as naming goes. We have a planet that is being subjected to wraiths, and ancients have had much stronger technology, but they have ascended. You may recognise a little here. Nevertheless, this has originality. Apparently, when you die, your spirit wanders in a space (analogy – purgatory?) but a bearer can incorporate such spirits, and in return the spirit conveys magical properties. For example, if someone propels some weapon at a bearer, he can "encode" tungsten – which means his outer surface becomes momentarily made of tungsten, a serious armour. The story follows Cade Elegy, who is such a bearer and has been a hero in the previous wraith war. However, all is not as it might be, and it turns out that while the war ended, it may not have been won as well as would be desirable. The story is fairly plot dependent, so I cannot say more. Cade Elegy is a reckless, but compassionate, guy hell-bent on making the Wraiths pay for taking away his beloved wife and children. Burdened with grief, the multiple phantoms vying for space in his head and feeling like a fraud, Cade is spiralling out of control. Enter the princess, headstrong and soft-hearted but lacking experience in the harsh world outside of the castle walls. She gives Cade no choice but to help her in her own quest to get to the bottom of her Uncle's death. I liked that the characters were flawed and the author took his time in allowing them to grow. The story ebbed and flowed throughout with action and short spates of passive activity. Towards the end of the book the fights increased with great feverishness that you get sucked in turning page after page you almost forget to come up for air. This is a risky thing for an author, in my opinion, as readers may feel fatigue from all the action. One thing I did not like was the author's proclivity for using 'Hells' and 'rubbed his/her chin' for a bunch of characters. It's quite likely that the author's own mannerisms bled into his characters. Aside from these minor issues, The Bearer's Burden keeps you on the edge of your seat because, despite its overall formulaic storyline and bits of cheesiness, it keeps you wavering with uncertainty as to whether any of the characters you love will make it out alive. And even though you expect something bad to happen after the short respite of peace, it still manages to surprise you. Packed with intense action scenes straight out of a blockbuster movie and poignant scenes involving the phantoms, I find it hard to believe this is Chad Queen's first novel. 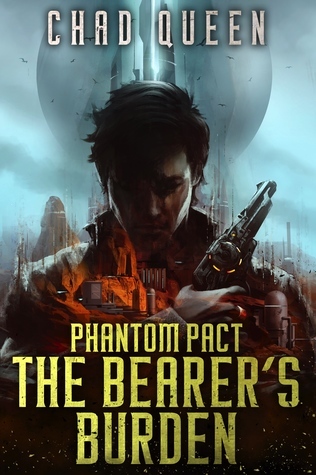 The Bearer's Burden is Book One in the Phantom Pact series by Chad Queen. The story is set in a dystopic world at war. Cade Elegy is a soldier called a 'bearer' who gains strength from forming a pact with phantoms. But sharing your head with the souls of the departed does not come without a cost. That's not Cade's biggest problem, however. Some humans have joined with the enemy, the Wraiths, who invaded Chalice a year ago, and it's up to Cade and Princess Ashlyn to save their world and stop any The Bearer's Burden is Book One in the Phantom Pact series by Chad Queen. The story is set in a dystopic world at war. Cade Elegy is a soldier called a 'bearer' who gains strength from forming a pact with phantoms. But sharing your head with the souls of the departed does not come without a cost. That's not Cade's biggest problem, however. Some humans have joined with the enemy, the Wraiths, who invaded Chalice a year ago, and it's up to Cade and Princess Ashlyn to save their world and stop any more people from dying like his wife and two children. With danger all around and doubts about who to trust, Cade and Ashlyn must work together to solve the mystery of whole towns of people disappearing, 'the taken,' and search for her uncle's murderer. The writing style and vivid descriptions draw the reader into the story. The author is a game developer, and the action scenes definitely have that kind of feel. But the book would have benefited from a bit more explanation at the beginning of the story about the world and the abilities of the main character, Cade, to provide a clear understanding and really ground the reader in the world of Chalice. It's not until later in the book that a lot of these details are revealed. The author ensures the reader is invested in the main character right from the very first chapter. I could almost hear the haunting melody when Cade described the phantom's song of his family, like the notes from a music box. While he struggles with tough issues (grief, addiction, hallucinations, voices in his head), his sarcastic attitude and responses make him a great antihero. Although, it's a dark story, there are brilliant touches of humor, especially in the interactions between Cade and Ashlyn, which serve as a counterpoint to the grimness of the world around them. And there are several surprising twists throughout the book. War with the Wraiths has ended. Cade Elegy, Protector of the Realm, returns home excited to reunite with his family. Only, when he arrives, the whole town has mysteriously vanished. A year later, addicted to ‘Nocturne’, a type of drug that helps Cade handle the many ‘phantoms’ (spirits guides) that exist within his mind, he is on a mission to find out what happened to his wife and two children. Traveling to less than desirable places, he is careful not to get too close to the ‘The Thread’. An ener War with the Wraiths has ended. Cade Elegy, Protector of the Realm, returns home excited to reunite with his family. Only, when he arrives, the whole town has mysteriously vanished. Traveling to less than desirable places, he is careful not to get too close to the ‘The Thread’. An energy source controlled by the Wraith. A source that the people of Chalice are beholden to. Finding her beloved Uncle Rolan dead in her quarters, Princess Ashlyn finally admits to herself that her father, King Liam, is not a good man. Kept away from him as well as her brother Elon, Ashlyn sets off to discover who killed the man who was more of a father to her. Finding Cade, together they begin an epic journey to find answers. It seems the Ancients, the Chalician ancestors, left many underground tunnels and elaborate machines, much of which are not fully understood. They soon discover that the insect like Wraiths and their army of Skex, wanted the war to end. But why? Their quest results in more questions than answers. With an underground faction, The Foundation, aiding their mission, can Cade and Ashlyn find the separate answers they are searching for? Cade Elegy, a former soldier and Protector of the realm, is haunted by the phantoms of his dead children and wife. Well, more than that, he’s bonded to them, at least his children. Cade is a Bearer, a sort of warrior monk, trained in the art of using the spirits of the dead to encode, or bond his body with various elements, turning their strengths into his own. Too bad the whole process takes its toll out on him, and the only thing that can help him keep his sanity is a dwindling supply of a dru Cade Elegy, a former soldier and Protector of the realm, is haunted by the phantoms of his dead children and wife. Well, more than that, he’s bonded to them, at least his children. Cade is a Bearer, a sort of warrior monk, trained in the art of using the spirits of the dead to encode, or bond his body with various elements, turning their strengths into his own. Too bad the whole process takes its toll out on him, and the only thing that can help him keep his sanity is a dwindling supply of a drug called Nocturne that’s just as likely to take his life as it is to save it. Princess Ashlyn feels like an outcast in her own home, her father, the king, and brother, the prince, are absolute strangers to her, and the only person she’s ever trusted, her uncle Roland, has been killed. Who can she trust to make sure her uncle’s final mission is seen through and his death is avenged? The only person she can think of is Cade Elegy, Protector of the realm. The two of them must work through their personal issues to figure out that the war that began many years ago with the alien race, the Wraiths, has never really ended. Unsure of who to trust, what’s even real, or where to turn, they have to rely on each other to get through all of this inact. Bearer’s Burden wasn’t at all what I expected it to be upon first reading the synopsis, and once I got started reading it I couldn’t put it down. I’m highly looking forward to the next installment of this series. Well-written, with amazing imagery, I can almost feel as if I’m in the story myself. In The Bearer's Burden, Cade Elegy is a war veteran who returns from battle abroad to find his family vanished, his mind literally plagued by phantom voices, and the world around him increasingly withering away. Recruited by Princess Ashlyn to help solve the mysterious murder of her uncle, the duo sets out on a quest and discovers that the war is not over with the Wraiths, an insect-like alien race. The book is filled with tons of action, often reading like a futuristic, military-operative video In The Bearer's Burden, Cade Elegy is a war veteran who returns from battle abroad to find his family vanished, his mind literally plagued by phantom voices, and the world around him increasingly withering away. Recruited by Princess Ashlyn to help solve the mysterious murder of her uncle, the duo sets out on a quest and discovers that the war is not over with the Wraiths, an insect-like alien race. The book is filled with tons of action, often reading like a futuristic, military-operative video game. However, the plot, the characters, and the development of both aspects lend itself to much more than that. I enjoyed the military aspect of this book, especially given the parallel of Cade and his phantoms with modern veterans and mental health issues arising from their service. A sense of duty, honor, and family is at the heart of The Bearer’s Burden with Cade who will stop at nothing to discover what happened to his wife and children and Princess Ashlyn whose determination to investigate the death of her uncle trumps her monarchical politics. The Bearer’s Burden starts off with a bang. In the middle of a war our protagonist Cade fights alongside his fellow soldiers against the Wraith, which are alien like creatures. Believing that their victory on the battle field has ended the war and blood spread, Cade returns to his village and his wife and children only to discover his city is destroyed and his family killed. A year passes, and Cade is still looking for answers to who or what took everything for him, but the more he looks the mor The Bearer’s Burden starts off with a bang. In the middle of a war our protagonist Cade fights alongside his fellow soldiers against the Wraith, which are alien like creatures. Believing that their victory on the battle field has ended the war and blood spread, Cade returns to his village and his wife and children only to discover his city is destroyed and his family killed. A year passes, and Cade is still looking for answers to who or what took everything for him, but the more he looks the more he realizes that more cities and people have vanished. Being recruited by the Princess, Ashlyn, to help solve her Uncle’s murder and creating a team, they soon realize that the war hasn’t ended and set out to save the remaining unscratched lands. his futuristic fictional work by Chad Queen certainly meets my idea of what sense of duty really means. This book contained the level of action I expected in a book of this standard. When you read a book that meets your expectation and ideas, there is this form of connection you have with this book. I felt really connected to this book, which each line I read, there was this desire to read on. This book is definitely an interesting book to read for lovers of sci-fi. The cover of this 428 pages is his futuristic fictional work by Chad Queen certainly meets my idea of what sense of duty really means. This book contained the level of action I expected in a book of this standard. When you read a book that meets your expectation and ideas, there is this form of connection you have with this book. I felt really connected to this book, which each line I read, there was this desire to read on. This book is definitely an interesting book to read for lovers of sci-fi. The cover of this 428 pages is beautifully designed to project you into the far future. The pages of this book have a way of giving you an out of this world experience. This book has a unique writing style that makes it easy to read and at the same time, the author Chad Queen leaves us with a lot to keep us engaged in the pages of this fiction. This is a very well written and detailed book about a man’s quest to find the lost, revenge, avenge, serve justice and help solve a murder brought to him by a princess. The extreme sci-fi nature of the book is sure to draw anyone in that genre in. The excitement and changes didn’t stop in any way and it kept you guessing with what would happen next. SPOILER ALERT: Once the ancient technology connection with Eos was established the story got really interesting. The connections lead him to the righ This is a very well written and detailed book about a man’s quest to find the lost, revenge, avenge, serve justice and help solve a murder brought to him by a princess. The extreme sci-fi nature of the book is sure to draw anyone in that genre in. The excitement and changes didn’t stop in any way and it kept you guessing with what would happen next. SPOILER ALERT: Once the ancient technology connection with Eos was established the story got really interesting. The connections lead him to the right places and warned him of the surroundings. Along with the other ‘phantoms’ and the many things he could do with it. The encoding part of what Cade could do is a really cool aspect to the story. Cade is “the protector” who didn’t believe in himself but eventually did after he truly gained control of all the phantoms, knowing exactly who he was and what he needed to do. Oh man. So, I'm sure if you've read any of the reviews, it's already obvious to you that this is an impressive debut for an author. There really isn't a whole lot I can say that hasn't already been said, but I'll do my best to sum up my feelings here. This is a phenomenal start to a series, there's no doubt. I certainly have more questions than answers at this point, but I don't feel like I've been left hanging. The world building! This is exactly what I look for in a sci-fi story. The characters are spot on as well. They are a mixed bag of personalities and motivations. The editing was fairly good, with just over a dozen typos. And it's not a short book either! It's seriously a bargain for the price of the ebook. You won't be disappointed. The Bearer’s Burden begins with Cade Elegy fighting in a war and coming home to find the entire town, including his family, has gone missing. He then realizes that the war he previously battled in is not really over. He begins to communicate with spirits who assist him in these new battleship. There are several supporting characters with mini plot lines, including Princess Ashlyn who is seeking his help in her Uncle’s death. The story itself is pretty fast paced with lots of action and fighting. The battles are descriptive enough that readers get caught up in that moment. While there is a little bit of romance, this is definitely not a romance novel. I can totally see how the author’s background as a video gamer played a role in this. He has a great imagination. I planned on reading a chapter or two and ended up just tearing this book apart. A magical world filled with death, despair, love, hate and the unknown of what will come in the future. Not once could I guess what was coming or about to happen and I was kept surprised the entire way through. Just what you want from this kind of book. The fantasy themes within this book reference mental illnesses and the effect that they often have hidden behind closed doors. Just wait until the end to find out th I planned on reading a chapter or two and ended up just tearing this book apart. I got a digital copy of this from a good reads giveaway and it was fantastic. It’s a good mix of fantasy and sci-fi with an interesting premise and enjoyable characters. I can’t wait for another installment if there is one! I have found this story to be sweet. I would not mind reading more in this series. I voluntarily reviewed an advanced copy. I really enjoyed this book. I've always loved the genre. It is a good and interesting read. We are proud to announce that THE BEARER'S BURDEN (Phantom Pact #1) by Chad Queen is a B.R.A.G.Medallion Honoree. This tells readers that this book is well worth their time and money! I was hooked all the way through! I really enjoyed the metaphysical aspects of the phantom pact and Cade’s journey as a bearer. All in all, a great level of suspense and action!